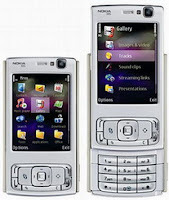 Nokia N95 is one of the most cool and anticipated Nokia smart phone, first release on September 2006. Actually, Nokia did not have plans to over the N95 to the United States, but most of U.S customers requests this phone to be able in U.S, so finally the Nokia company decided to spend this smart phone across the pond. 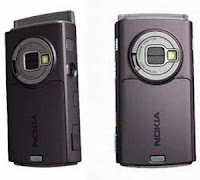 Nokia N95 was installed high quality 5-megapixel camera with auto-focus abillity, that can also take or record videos with VGA-quality. Also integrated GPS receiver, HSDPA 3G and WiFi 802.11 b/g data support, built-in GPS capabillities covers 100 countries worldwide. This phone's layer was a large display with 2.6" QVGA (240x320) display that can display 16 millions different color shades. 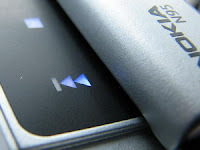 Featured media player with 3.5mm headphone jack, dual-slider design, and bluetooth connection. This Phone dimension is 100 x 53 x 20 mm (3.9" x 2.1" x 0.8") with weight is 121gr, its somewhat large slider form factor handset. The design was normal silver paint finish if you are looking from front of it, but sides and back of the device make use of a soft touch style deep burgundy color paint that has some elegant feels. 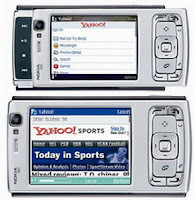 Nokia has done so far better job with a slider mechanism on N95 than it did on N80. The innovatice two-way slider design, not only can slide the front cover up to reveal the keypad, it can also slide down to expose the media controls. phone boasts a 5-megapixel camera that produces good-quality photos and videos. It comes with advanced multimedia capabilities and has a 3.5mm headphone jack. networks; standby battery life is poor; and performance is somewhat sluggish. The hardware feels a bit cheap, and the sliding mechanism could be more secure. It's truly amazing what computers have become, nice looking phone and great performer. Large screen display, powerful processor with 2D/3D graphic and video acceleration, complete connectivy options (HSDPA, WLAN b/g, UPnP, USB 2.0 and Bluetooth 2.0 EDR. 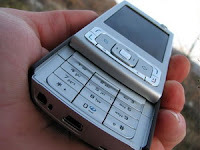 If you want to get a camera phone that can provide good quality picture, you should try to purchase this Nokia N95 because its integrated with 5-Megapixel camera. It's like a amateur digital camera with so many high technology featured. N95's camera can record video clips of mini-DVquality comparable to amateur digicam quality. Also great audio and video playback capabilities, TV out connector, built-in GPS receiver and good mapping softwares are featured in this phone.